While stationed at the Naval Postgraduate School in Monterey, California, my husband and I made the promise we would take advantage of this relatively relaxed period in his career to explore as much of the West Coast as possible during our 18 month assignment, as we knew we probably not be returning to California anytime soon. 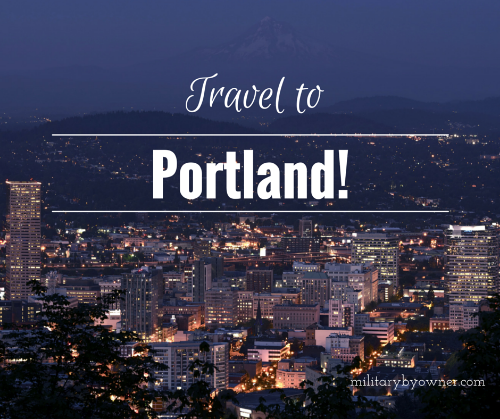 Our best surprise destination was Portland, and Oregon in general. It was the first trip for both of us to the state and we planned it perfectly. After a short flight from San José’s Mineta International Airport to Portland International Airport, we rented our car and drove south through the city to the state’s booming wine country, Willamette Valley, about one hour away. Pinot Noirs are the valley’s signature grapes, but we weren’t going to discriminate and planned to have a wine tasting tour to capture the region’s flavors. Anxiously awaiting check-in time at our hotel, we explored the small cities of Newburg and Dundee, near our resort destination, The Allison Inn and Spa. Newburg has a charming downtown area where we lingered over lunch at a bookstore café, but I had researched The Allison thoroughly and was eager to investigate the property. The resort was everything I hoped it would be. In all sincerity, it ranks in my top two stays of my travelling history. The whole experience was so peaceful and restful. We stayed in a garden room for our anniversary trip and were not disappointed. The room was so large and designed so fabulously, I hardly wanted to leave the grounds. In fact, we didn’t leave at all except to take a vineyard tour with local favorite, Backroads Wine Tours, later in the week. The amenities in the room were above what we expected, in part because they pampered us with an Oregon Pinot and local chocolates for our anniversary celebration. One of my favorite extras was the recycled dairy bottles filled with water left in our room’s bar area. They were a sweet idea and I would buy the glasses from a retailer if possible. The same goes for the repurposed green wine bottles turned into water glasses left in the room. Sadly, we had to check out of The Allison, but we were excited to proceed back up north to Portland to resume the rest of our trip. Next stop, beer tasting! Portland is known to be one of the best brew cities in the country and my husband picked a great way to explore the breweries in the area. We made reservations to board the ever popular BrewCycle. The BrewCycle is a tour company that owns a multi-person bike type wagon that is pedal operated. Groups pedal from brewery to brewery for two hours, tasting as they go. It was also a great way to get personal attention from a tour guide that knows the city. This included tips on where to eat, and boy did we eat! We made a point to leave our picturesque hotel, the Kimpton Riverplace, early one morning and hunt down some of my favorite things: donuts! Yes, it’s a thing of ours, each place we visit we like to check out the city-specific styles they produce and we weren’t disappointed in Portland. If you're into donuts too, walk over to these two spots. Both chains have a couple of locations. Of the two, I prefer Blue Star Donuts. It’s a little less known than Portland’s very own Voodoo Donuts, but I think the quality is superior at Blue Star. There was a European influence in the ingredients and style that made them stand out. You won’t make it out of the city without seeing someone carrying a box of Voodoo Doughnuts and that is a good thing. The shop has a fun history with kitschy interiors and even crazier donuts. Voodoo Doll doughnut, anyone? Most of the days we spent in Portland were rainy and cool, so we trudged through the weather while sightseeing. A nice relief from braving the elements was a meal at the Blue Plate Lunch Counter. We saw a piece on the Food Network describing the fare and sought out its location for grilled cheese and tomato soup, which were very fulfilling on a blustery day. Sitting at the counter, we watched the cook make our meals as well as for the rest of the packed store front. The place is tiny and had a long wait time for tables, but the people queued down the street anyway. The ambiance was chaotic and noisy, so if you want a relaxing and leisurely lunch, move on because a hungry diner who has yet to have eaten will be constantly watching for your table to open up. Our last eating adventure brought us out to Salt and Straw on NW 23rd for gourmet ice cream at its best. It was the finest we have eaten, actually. We went because other than beer, ice cream is my husband’s other favorite food vice. We were happily introduced to a flight of ice cream to sample. The shop’s innovative flavors are regularly featured in national foodie publications. Salt and Straw fits in with Portland’s innovative culinary scene easily. We had to say goodbye to the Rose City on a Saturday, but we purposefully made time to visit the Portland Saturday Market. The market is the city’s largest outdoor arts and crafts venue with over 250 vendors. Again, it was raining, otherwise we would have perused the wares longer, but we did purchase a handmade wooden cheese board and visited several gourmet food trucks while shopping. Let me offer one last bit of advice for your trip to Oregon. The town is known for its homeless population and it is something to consider if you explore the city by foot like we did. Make smart choices by walking during the day and sticking to well-known routes. In general, use your big city street smarts and enjoy your time in Portland!